Appendicitis is commonly encountered in the ER and is the leading cause of surgical emergency in the abdomen. The initial evaluation for a presentation that is concerning for appendicitis often includes history taking and exam, supplemented by labs. The Alvarado Score is a 10 point rating scale that is widely used as a tool to help decide whether or not a patient presenting with abdominal pain requires CT imaging (although it’s overall clinical usefulness is controversial). It is outlined here by MDCalc. According to the rule, a score of greater than 4 warrants CT evaluation and greater than 7 requires immediate surgical consult. CT scan is a highly sensitive and specific tool in diagnosing appendicitis, however it comes with radiation, cost, and sometimes IV contrast risks. In the pediatric patient population radiation from CT scans are not as desirable as the long-term consequences have theoretical potential to be deleterious (long discussion…for another post maybe!). The purpose of this article is to go over characteristics of appendicitis that can be seen on a CT scan. The use of contrast is a long debated point of contention amongst the emergency medicine community and the usual practice varies between institutions. Medscape has a great rundown of the issue here, which notes that the use of contrast may be more beneficial in circumstances where appendicitis is a relatively less likely diagnosis because the contrast better helps characterize other possibilities. Contrast studies are also more helpful in the patient not expected to have a large amount of intraperitoneal fat. As usual, it is important to understand the local anatomy when analyzing radiological images of the abdomen. 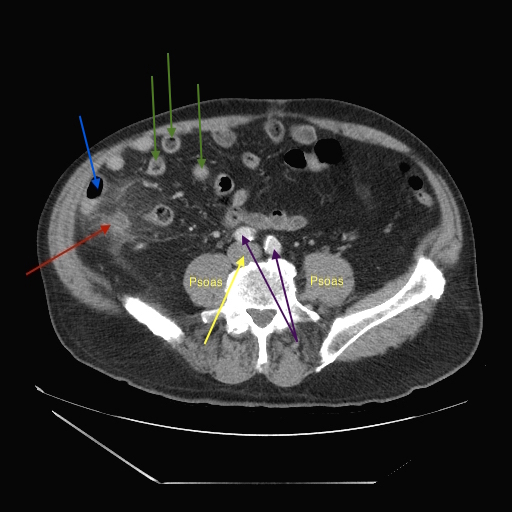 The image below is an example of an axial cut, non-contrast abdominal CT of a patient who came in with abdominal pain concerning for appendicitis. Try to identify the following structures: vertebrae, psoas major, IVC, iliac arteries, small bowel, colon and appendix. Overall, CT has a high degree of sensitivity and specificity when used to evaluate the possibility of appendicitis. The clues outlined above, especially when seen together and as a part of a larger clinical picture that fits with appendicitis, are instrumental in confirming the diagnosis. Ohle R, O’Reilly F, O’Brien KK, Fahey T, Dimitrov BD. The Alvarado score for predicting acute appendicitis: a systematic review.BMC Med. 2011 Dec 28;9:139. doi: 10.1186/1741-7015-9-139. Review. PubMed PMID: 22204638; PubMed Central PMCID: PMC3299622. Reich B, Zalut T, Weiner SG. An international evaluation of ultrasound vs. computed tomography in the diagnosis of appendicitis.Int J Emerg Med. 2011 Oct 29;4:68. doi: 10.1186/1865-1380-4-68. PubMed PMID: 22035447; PubMed Central PMCID: PMC3215954.